A blend of the words snow and apocalypse, snowpocalypse is a major winter storm—the kind that shuts down a city or ... induces some dramatic overreactions. Hi! 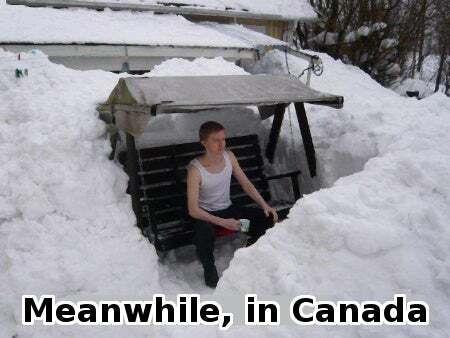 It is 100% our intention to play on Wednesday night even if there's a snowpocalypse!! More info tomorrow, but hopefully see you at @roughtradenyc Wednesday night(and tonight)! Ps I think they just released some more tickets for Wednesday night. The Snowpocalypse has struck and Portland is currently in full panic and "abandon your cars" mode. Traffic is at a standstill, thousands of cars are reportedly stranded, school buses are unable to pick up kids in certain areas, and people are getting home in any way possible. 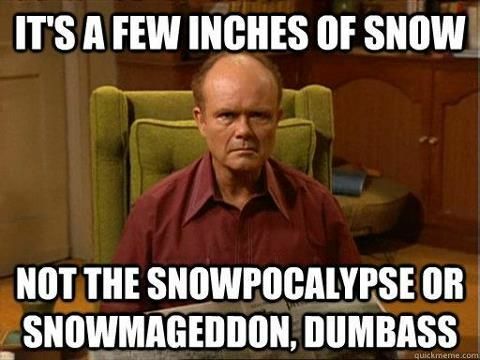 Where does snowpocalypse come from? Snowpocalypse, along with another blend, snowmageddon (snow and armageddon), is found online by 2005, but the full force of the term came during the 2009–10 winter that rattled the mid-Atlantic region of the United States with a series of unusually strong winter storms. The first was a December 2009 blizzard in Washington, DC that dropped over 16 inches of snow, making it the seventh most intense snowstorm the city had ever seen—only to be broken just weeks later in February 2010. That February in New York City, the same storm—being called the snowpocalypse in the news and on social media—closed schools, courts, and the United Nations headquarters. It even caused the Big Apple to park subway cars in the middle of tunnels just to prevent them from freezing. The 2009–10 storms wreaked havoc for people trying to travel to and from the East Coast, with more than 5,900 flights cancelled on one February day alone. Veritably snowpocalyptic. 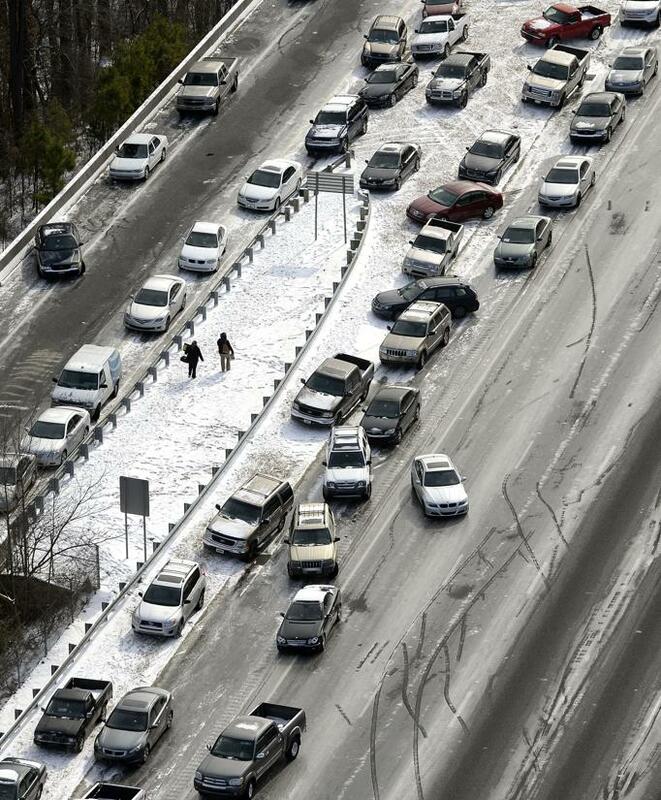 In 2014, snowpocalypse was used ironically to describe a rare winter storm that hit Atlanta. While the storm only dropped a mere two inches of snow, it paralyzed the city, not used to and prepared for that amount of snowfall. The conditions completely shook Atlanta-area residents, causing horrible gridlock that led many to abandon their cars on streets and highways. The Walking Dead meets Frozen? Compared to the the mid-Atlantic’s snowpocalypse of 2009–10, the Atlanta storm was small, compelling more seasoned winter residents to poke fun at the overreaction of Atlanta’s residents with the term snowpocalypse. The news and social media rolls out snowpocalypse any time a major storm shuts down, or is predicted to shut down, schools, workplaces, public transportation … and civilization as we know it. 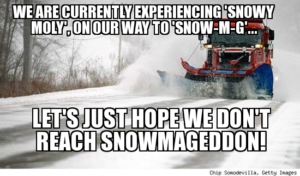 Expect to see it alongside snowmageddon and other snow-based blend words we loved in the 2000–10s (e.g., snowzilla = snow and Godzilla or snownami = snow and tsunami).